Plenum rated VGA Cable with low profile small heads and small cable diameter and this one has 3.5mm Audio, make this the perfect cable for installation in raceways and tight spaces. 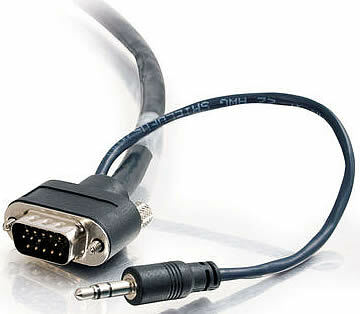 This computer audio/video combination cable is an economic alternative, and saves valuable installation time versus installing and purchasing individual cables. The HD15 connectors are low profile (1.25in total depth) which saves valuable space in the gang box, while the rounded shape (fits 1.25in diameter mounts) accommodates smaller mounts so that the cable can be easily hidden from view. The 3.5mm connectors are also low profile (1.5in total depth) and feature specific breakout lengths to fit your application. The cable is conveniently labeled to identify the 6in breakout for mounting in electrical boxes and the 20in breakout for the display or projector end. This combination cable is constructed from three 30 AWG coaxial plus one 26 AWG twisted pair to ensure RGBHV signal integrity in your installation. The coax cables feature a tinned copper braid that provides 92% minimum shielding. The audio uses 26 AWG fully-shielded conductors to prevent interference from the RGBHV signal. Overall the cable is well constructed to protect and prevent any EMI/RFI interference, and to ensure that the highest quality signal is transmitted for optimal audio/video performance.